The Province o Santa Fe, in Spainyie Provincia de Santa Fe (pronoonced: [santa ˈfe]), is a province o Argentinae, locatit in the centre-east o the kintra. Neebourin provinces are frae the north clockwise Chaco (dividit bi the 28t parallel sooth), Corrientes, Entre Ríos, Buenos Aires, Córdoba, an Santiago del Estero. Thegither wi Córdoba an Entre Ríos, the province is pairt o the economico-political association kent as the Center Region. Santa Fe's maist important ceeties are Rosario (population 908,000), the caipital Santa Fe (369,000), Rafaela (83,000), Villa Gobernador Gálvez (74,000), Venado Tuerto (69,000), Reconquista (66,000), an Santo Tomé (58,000). Soy fields near Runciman. 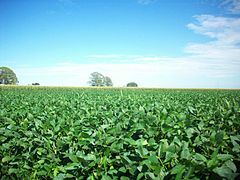 The soy harvest, maistly for export, dominates Santa Fe agricultur. The province is dividit intae 19 depairtments (in Spainyie, departamentos), an the depairtments are dividit in destricts which can be organisit as communes or municipalities. The communes are smawer touns, generally admeenistered bi a local commission led bi a "communal preses". The municipalities, which must hae mair than 10,000 inhabitants, are wha is commonly cried "ceeties". Municipalities hae an executive officer (a mayor, cried intendente) an a legislative body (cried Concejo Municipal, a deliberative cooncil). For admeenistrative purposes, each depairtment haes a heid toun (cabecera), which mey be either kynd o destrict. This page wis last eeditit on 11 Mairch 2018, at 03:44.